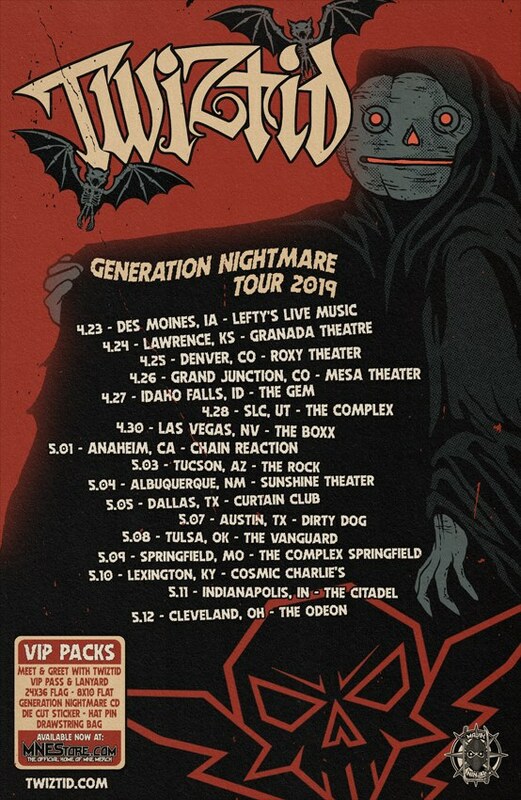 Radio420™: Twiztid Announces Part 1 of the Generation Nightmare Tour This Spring! Twiztid Announces Part 1 of the Generation Nightmare Tour This Spring! You excited for Twiztid’s upcoming LP “Generation Nightmare”?! How about a Twiztid tour directly supporting the release of “Generation Nightmare”?! Well the demented duo just announced Part 1 of the Generation Nightmare Tour slated for this Spring with VIP available. No word yet in regards to other artists joining the tour. Part 1 kicks off April 23rd in Des Moines, Iowa and looks to finish May 12th in Cleveland, Ohio. Never know more dates could be added for part 1. But the dates do look to be set in stone until part 2 of the Generation Nightmare Tour is announced. Halloween has come early and we here at FLH are super stoked!